Sound Shifting deals with the visualization and illumination of invisible phenomena that significantly shape our perception to create three-dimensional representations of sound. Different methods are used to translate sounds into three-dimensional objects. The sculptures are designed to provide information about the represented sounds through their shape and aesthetic features. Through this transformative process the range of our perception is expanded, by creating new perspectives. The 3D sound sculptures are snapshots and contemporary documents of various soundscapes. Together they form a three-dimensional archive of sound visualizations. 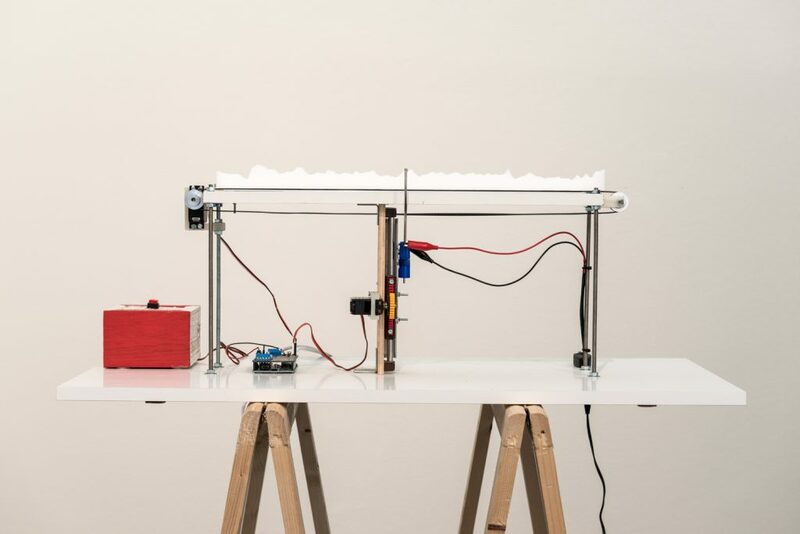 Audio Foam Cutter transforms sound into styrofoam and other similar materials. The device consists of a hot-wire cutter mounted on a servo motor that is controlled by audio signals. This combination allows users to cut the sound input vertically and in real-time into the material as it is passed through the machine. The resulting cutouts are used to create casting molds for a wider range of poetic materials. They also stand alone as tiny sound sculptures.